Former Liverpool striker John Toshack says there is "a dark cloud hanging over Anfield" that has contributed to the Reds' poor start to the campaign. Brendan Rodgers' team have won six of their 16 games in all competitions. Liverpool narrowly missed out on winning the Premier League title last term, finishing two points behind champions Manchester City. "I still think they're feeling the effects of that a little bit," Toshack, 65, told BBC Radio 4's Today programme. Liverpool looked likely to end their 24-year wait for a league championship until the 2-0 home defeat by Chelsea with three matches remaining in April. Welshman Toshack, who spent eight years as a player at Anfield, said: "I still think there's a dark cloud hanging over Anfield from what happened. "They went so close after being so long without winning that championship. "I still think there's a bit of a hangover there. It's a bitter pill to swallow for them." Liverpool's success last season ensured they returned to the Champions League after a five-year absence but the Reds have made an inauspicious return to Europe. They lie third in Group B after three defeats from their opening four fixtures and Rodgers attracted criticism for selecting a weakened team for Tuesday's 1-0 defeat by Real Madrid at the Bernabeu Stadium. Rodgers defended his decision to make seven changes before the visit of Chelsea in the Premier League on Saturday. But Toshack, who had two spells as manager of Real in 1989-90 and 1999, said: "Liverpool really are going through a bit of a dodgy spell. "It looked very much to me as a bit of a damage limitation job. I don't say they were happy losing 1-0 but I think that if Liverpool had nicked a goal then Madrid would have gone straight down and got another one. "I think both sides were reasonably happy yesterday." Was Rodgers's team selection right? 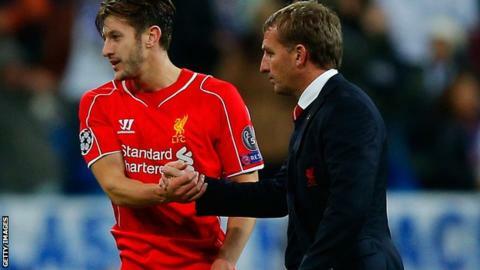 Read more on Was Liverpool boss Brendan Rodgers right to rest star players?